On the television broadcast, CBS play-by-play man Don Criqui started thanking his production crew. After all, that's what you do when the game is over. Practically speaking, the November 19, 1978 game between the Giants and Philadelphia Eagles was all wrapped up. The Giants led, 17-12, with 31 seconds left. All quarterback Joe Pisarcik had to do was take a knee twice, and the end was official. The fans at Giants Stadium had already headed for the exits. However, the Giants coaching staff inexplicably called a running play, and Pisarcik muffed the handoff to running back Larry Csonka. 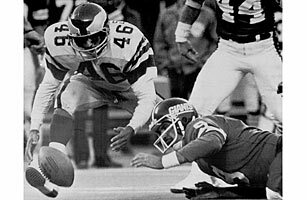 The ball popped loose, and Philadelphia's Herman Edwards picked it up, and sprinted into the end zone. The touchdown gave the Eagles an improbable 19-17 win. The media dubbed this game "The Miracle at the Meadowlands." For Giants fans, it was nothing but a nightmare.